It was a very pear-shaped day, in terms of our snack at least! 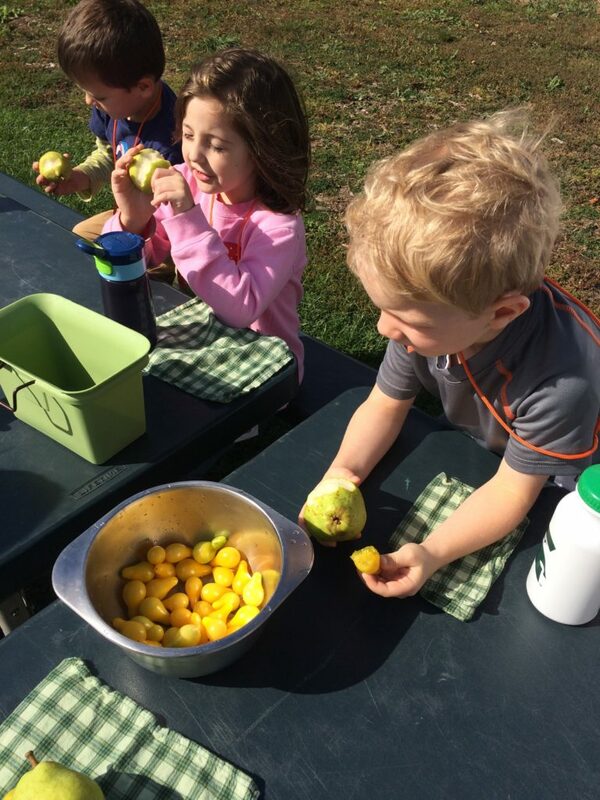 We stepped up to the challenge to find shapes all around the farm and our snack included not only harvesting the traditional green variety of pears from a tree, but also yellow pear tomatoes from a bed outside of the Activity Center. 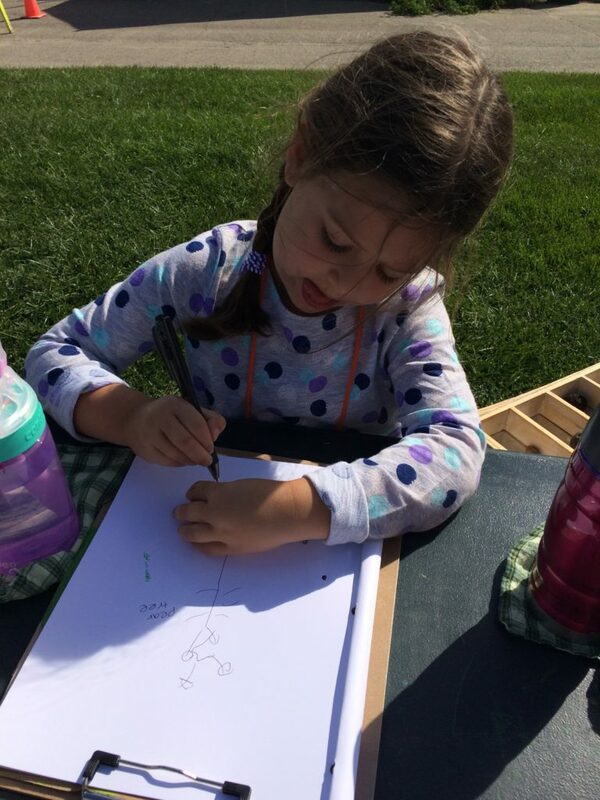 The children signed-in today by using alligator-shaped tweezers to chomp their fish-shaped names out of the pond We had some fun with farm stamps and finished personalizing our nature journals. 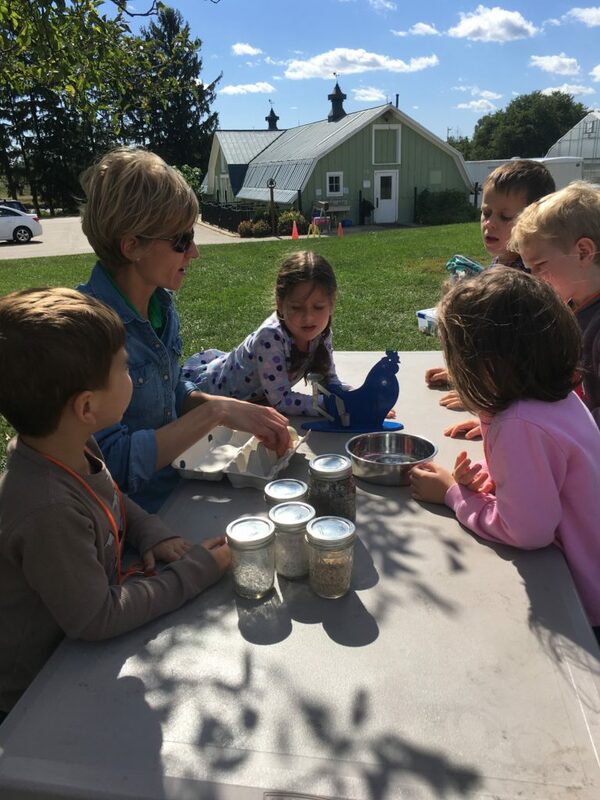 Farm Sprouts also worked with a balance scale to weight natural materials. 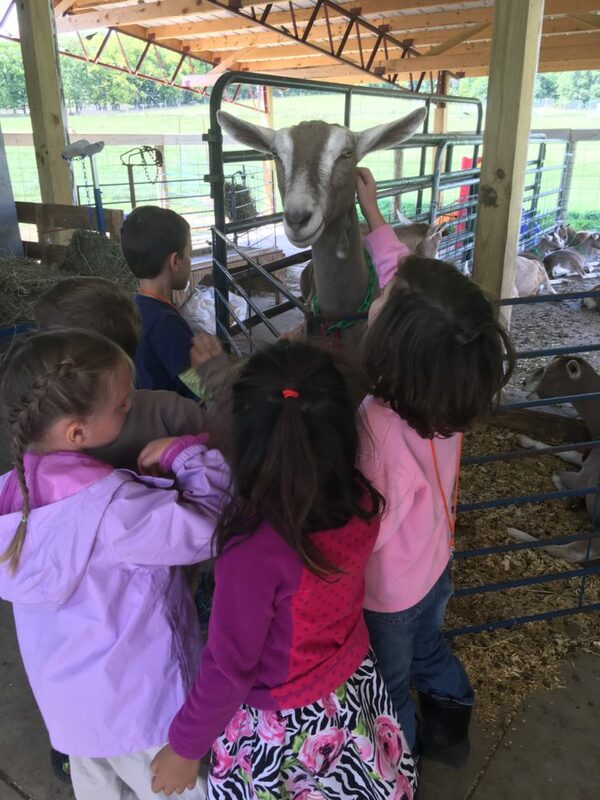 Scales have many uses on a farm, from weighing animals to eggs! 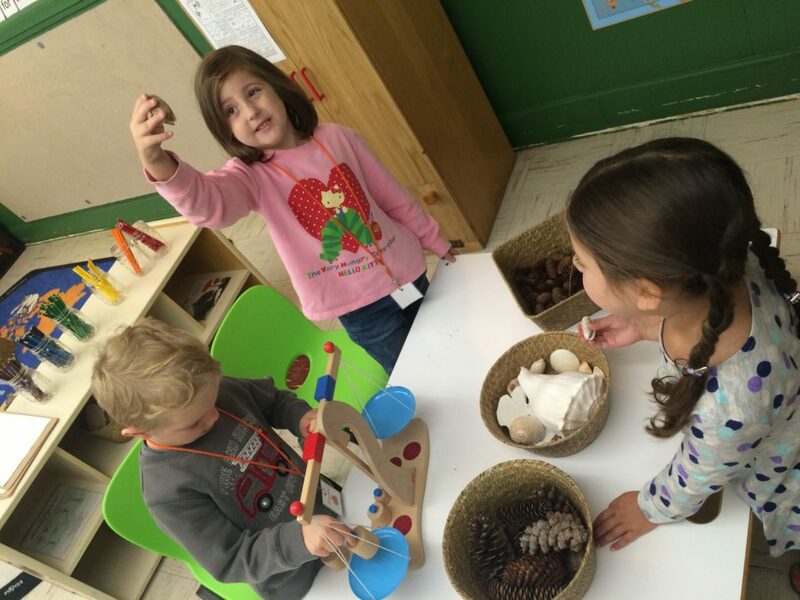 During our morning gathering, we greeted each other in Spanish and reviewed the words for duck (el pato), pig (el cerdo), and added rooster (la gallina) with puppets. 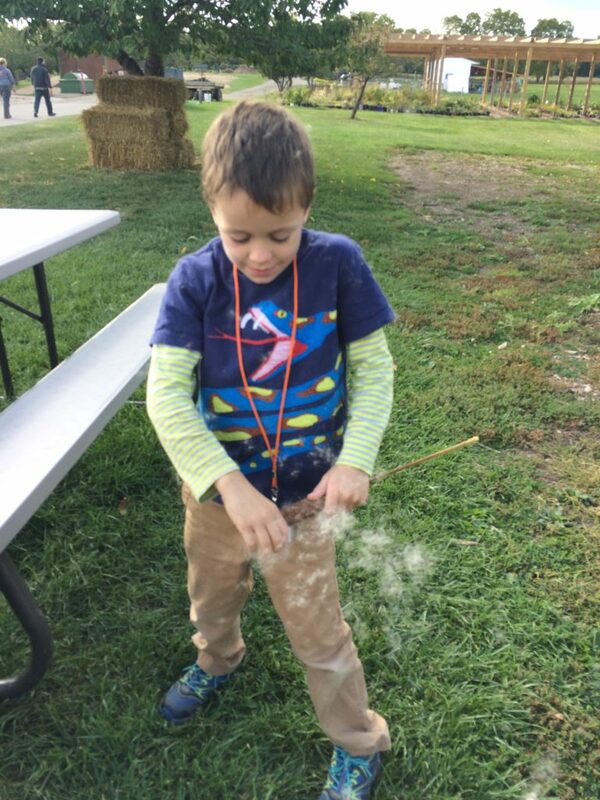 We read the story, Pick a Circle, Gather Squares: A Fall Harvest of Shapes by Felicia Sanzari Chernesky. 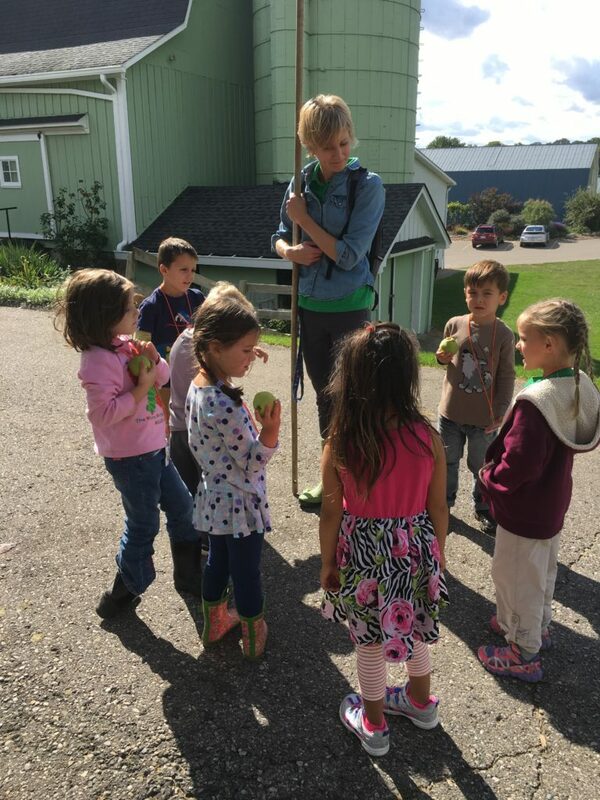 We played a memory game, called “Keep in Mind,” with shape bean bags before heading out to find shapes on the farm. 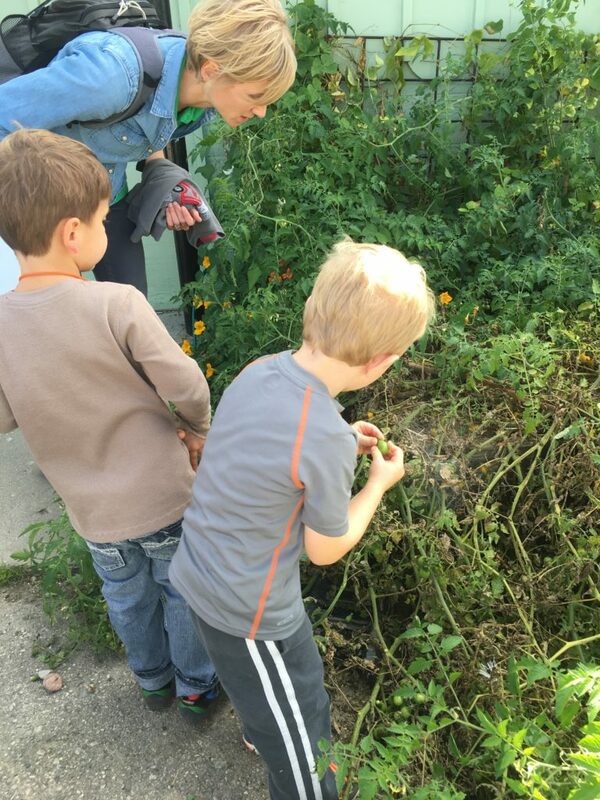 Right away we found heart-shaped leaves and circle sunflower heads when we stopped for our weekly observation of our sunflowers. 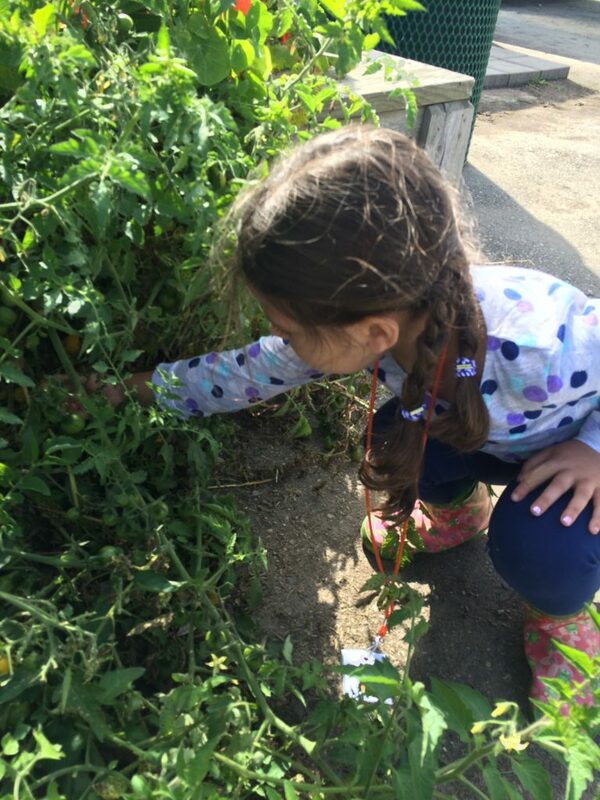 We also noticed star-shaped tomato flowers and sepals. 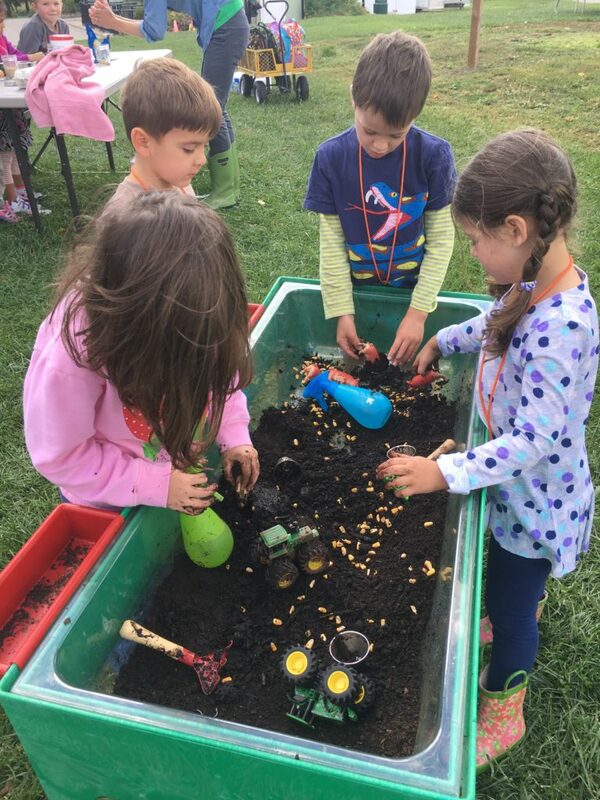 In the Children’s Garden, we made mud in the sensory bins for imaginative play with pigs, corn, and troughs. 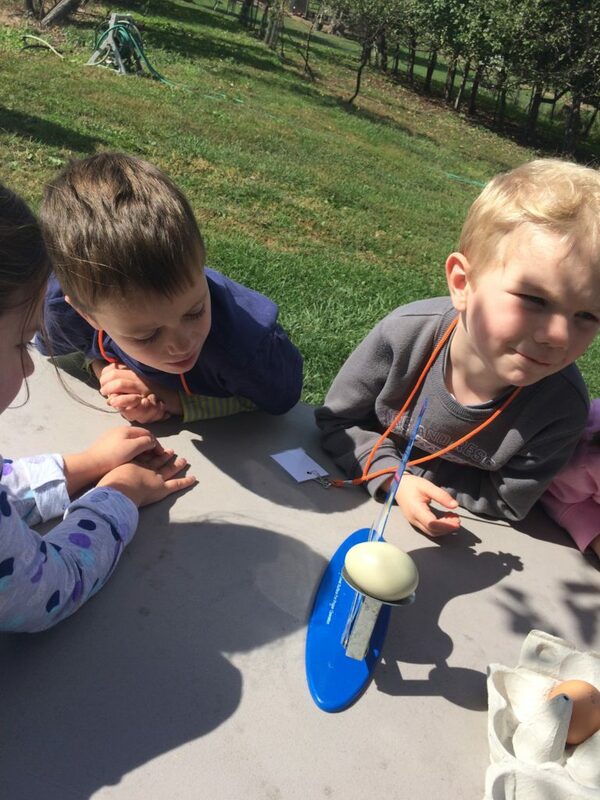 We also began exploring embryology by weighing eggs using an egg scale, cracking open an egg, and making observations. 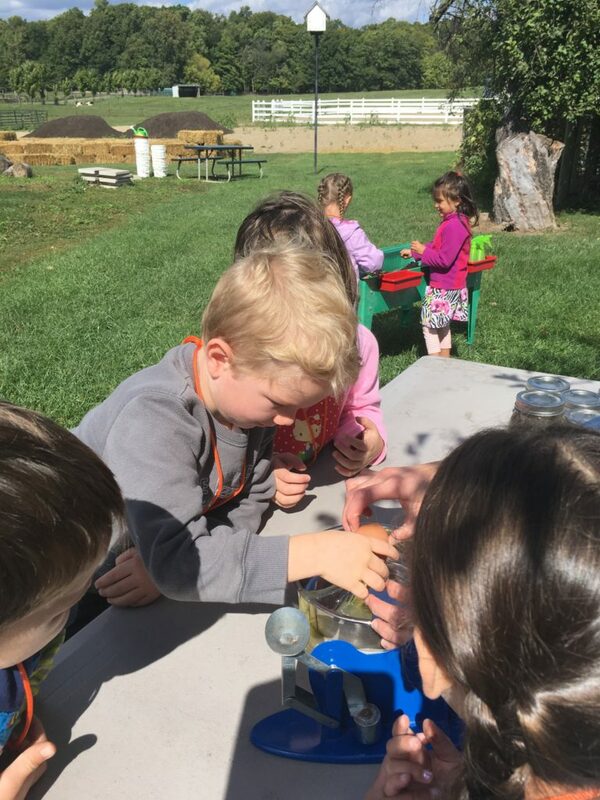 Some inquiry-based questioning guided the Farm Sprouts to develop an experiment in which they will test whether an egg floats or sinks. 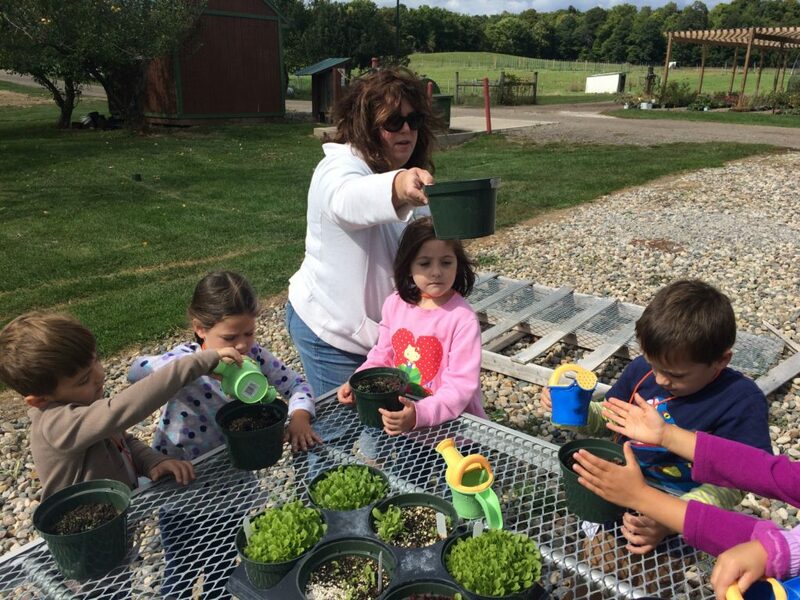 The determined they would like to use a variety of colors and sizes and will need water and a container. They made predictions as to what they think will happen. We’ll carry out the investigation next week. 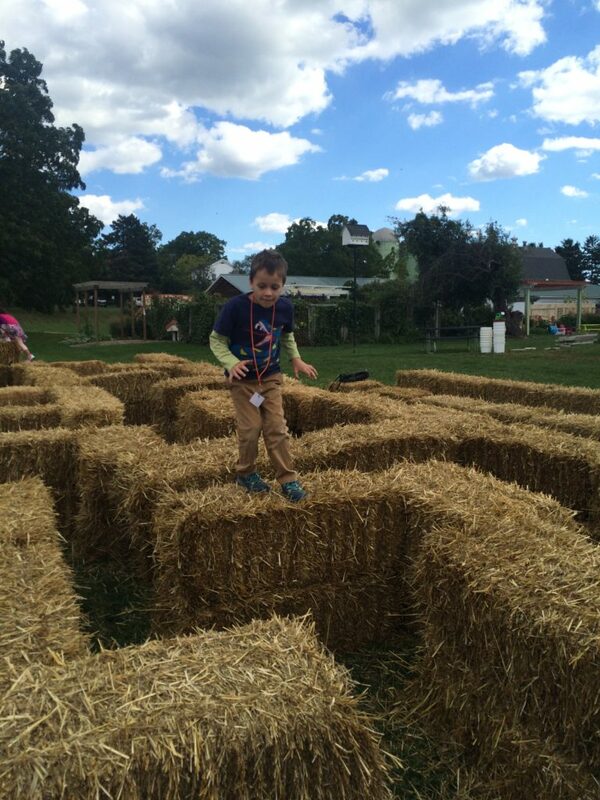 Next we had the opportunity to navigate the straw maze set up for our fall season events and programs. 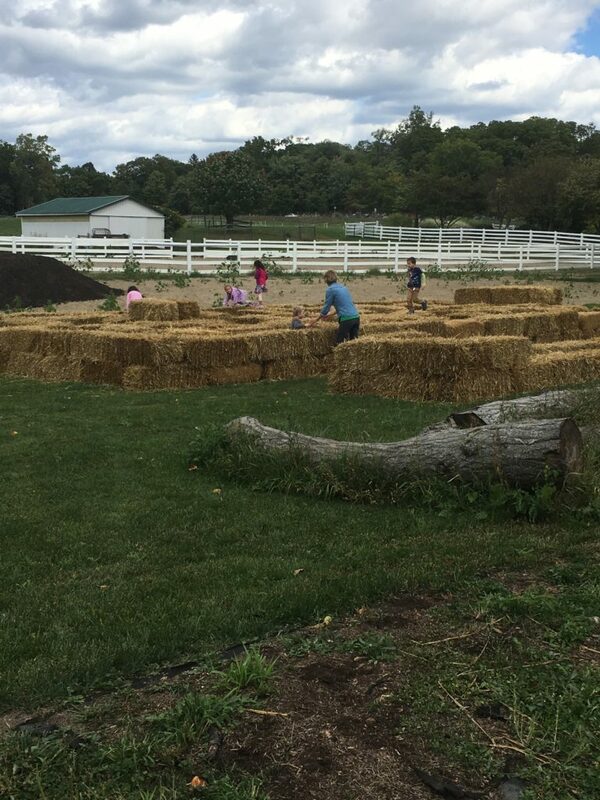 We noticed the straw bales are in the shape of rectangles and had a lot of fun running, jumping, and hiding. Fortunately everyone found their way out safely! 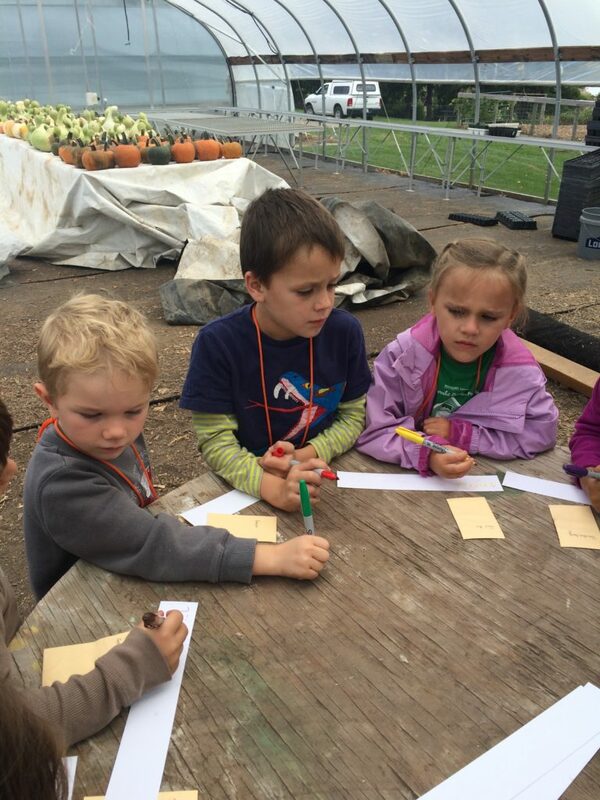 We stopped by the greenhouse to care for our lettuce. 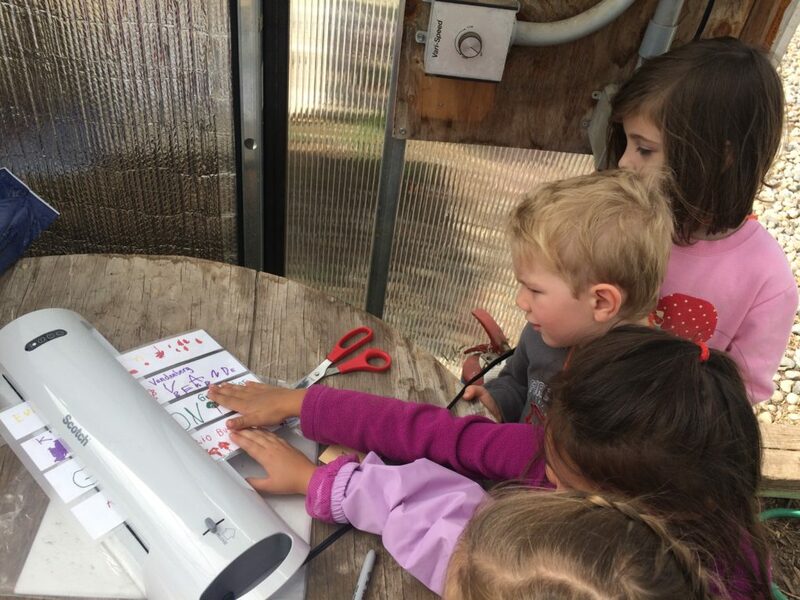 Farm Sprouts devised a plan for creating labels for their pots, which included using permanent markers to write their names and the lettuce variety and a way to make it waterproof, which led to the use of a laminating machine. 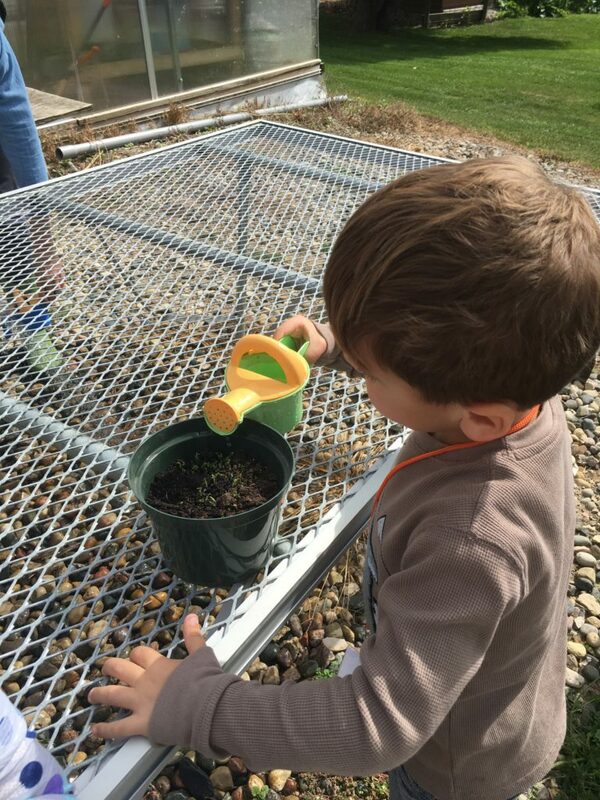 Our lettuce varieties have sprouted and we’ll continue to care for them and monitor their growth. 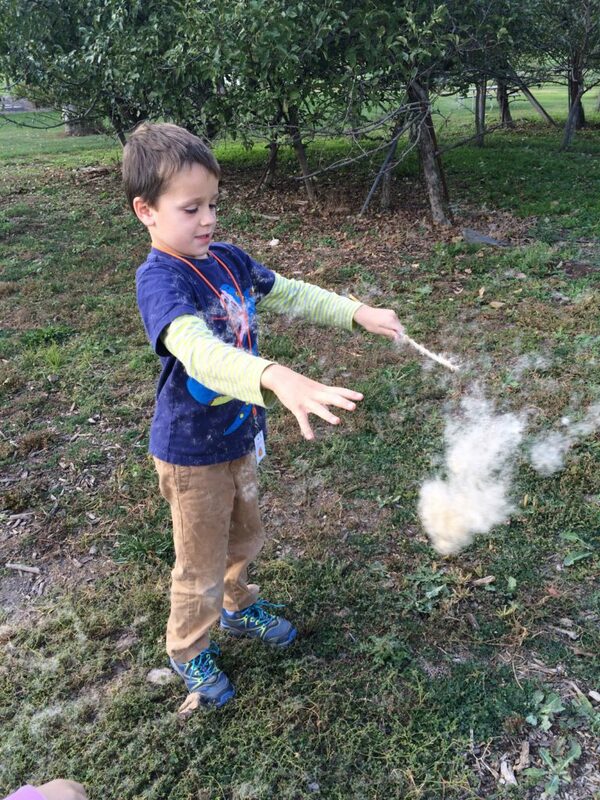 We were responsible for chores in the chicken coop today. 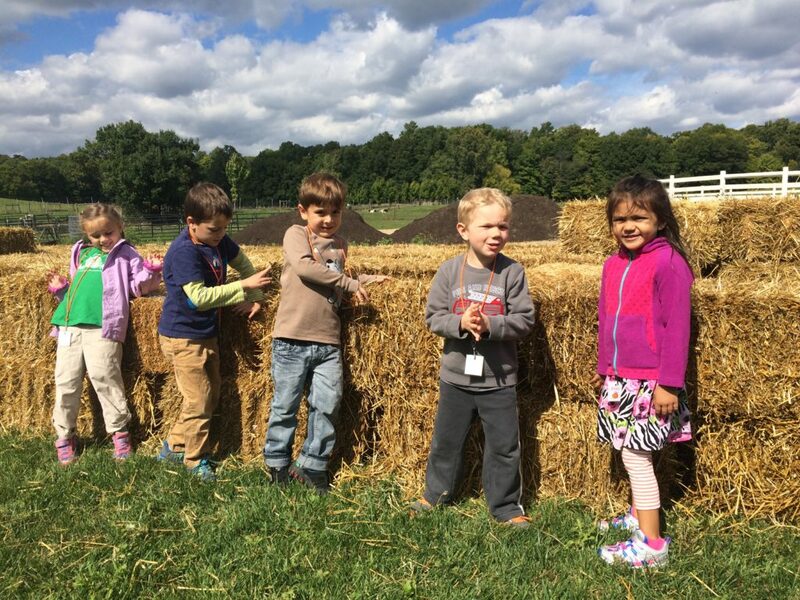 It was our first time visiting the animal barn, so we reviewed some important safety instructions and familiarized ourselves with the barn. We briefly met the goats before focusing on the chicken coop. 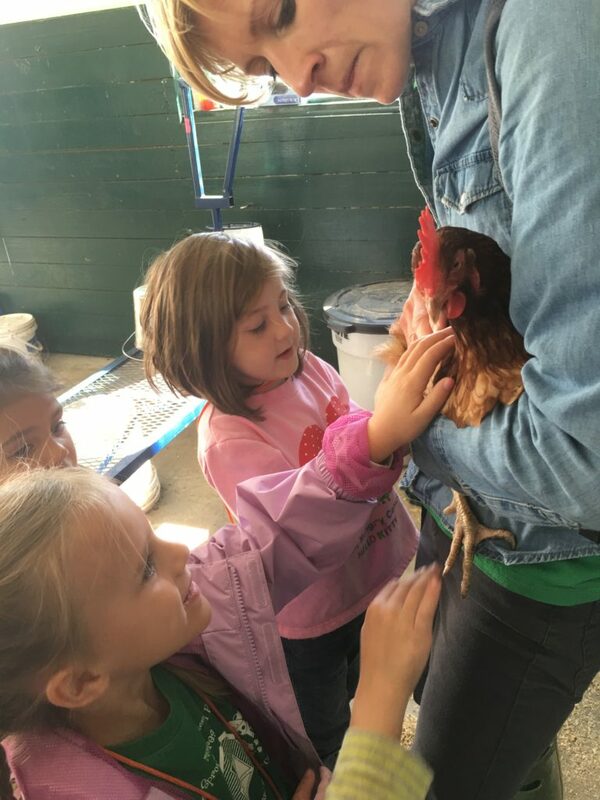 Farm Sprouts worked together to collect eggs and had the opportunity to touch a hen. We noticed her comb, wattles, feet, and feathers. We found some shapes on her as well, including her circular eyes and triangular beak. 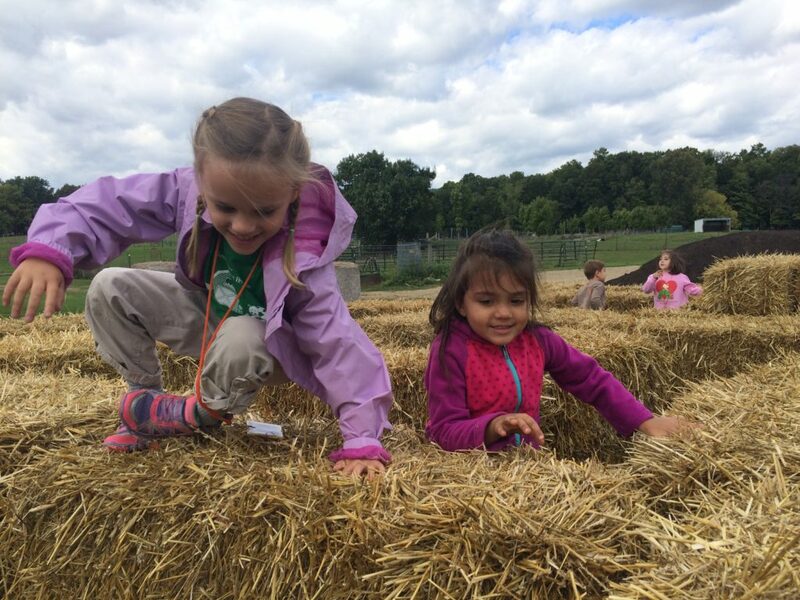 We’ll return to visiting the chickens and think about how chickens are similar to and different from ducks and people. 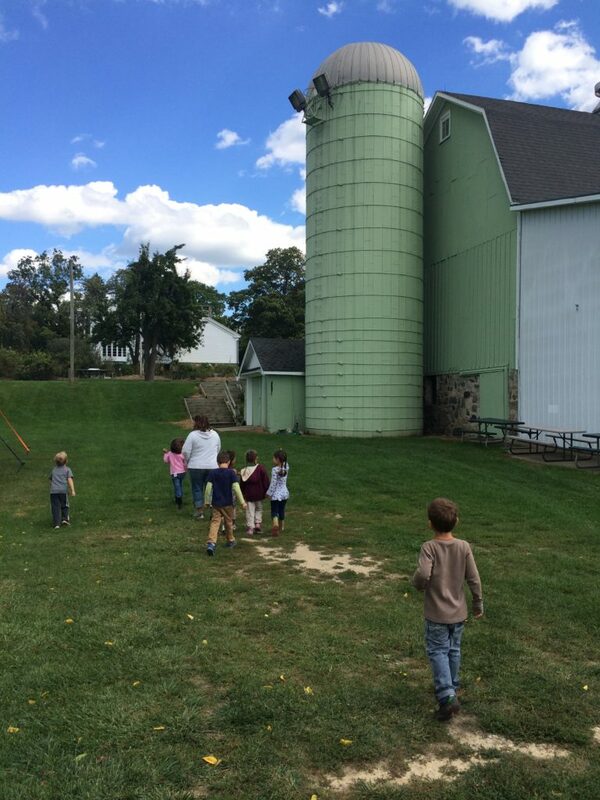 We made our way up to the pear trees near to the silo. 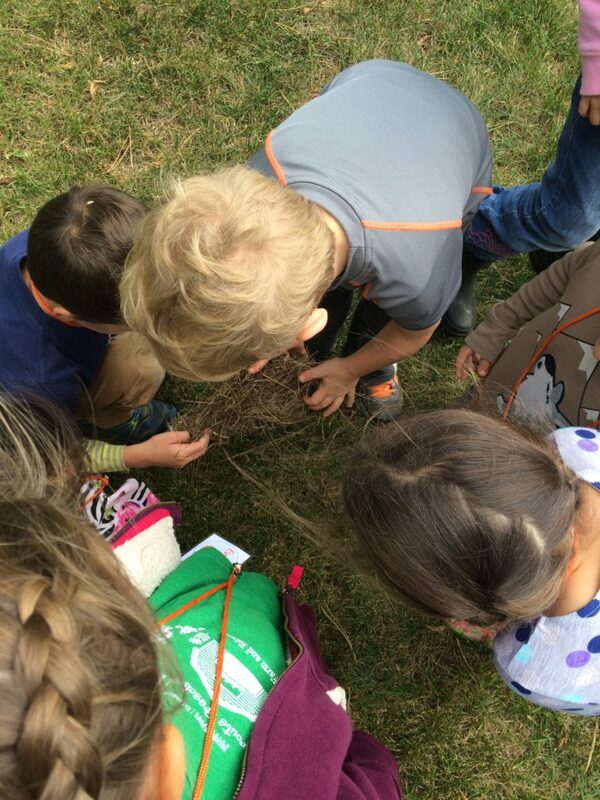 We discovered a bird’s nest blown from a tree with the high winds. 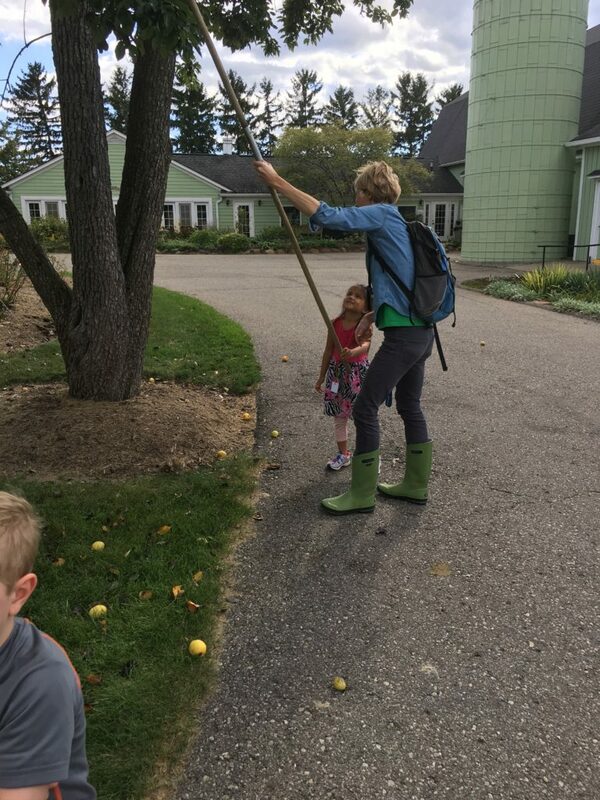 Farm Sprouts each had the chance to use a fruit picker to harvest a pear from a tree. 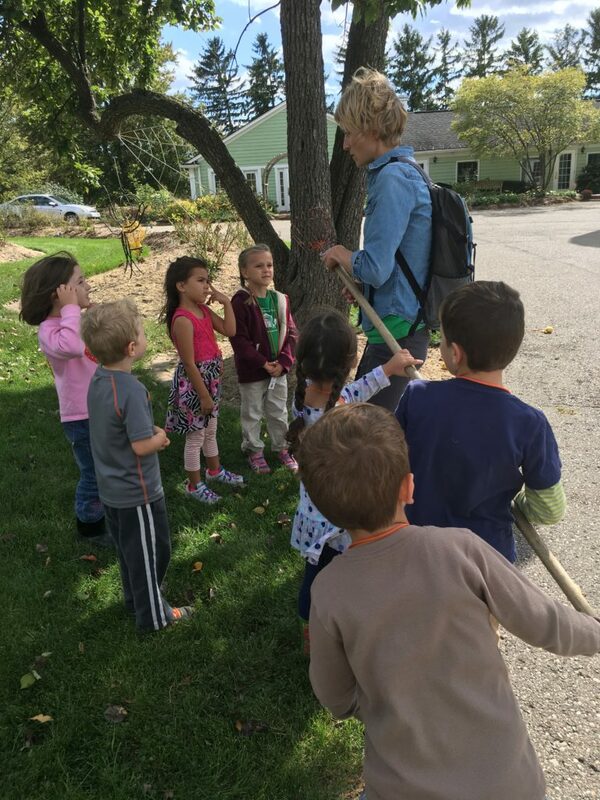 We took them back to the Activity Center to wash them and harvest the pear tomatoes. 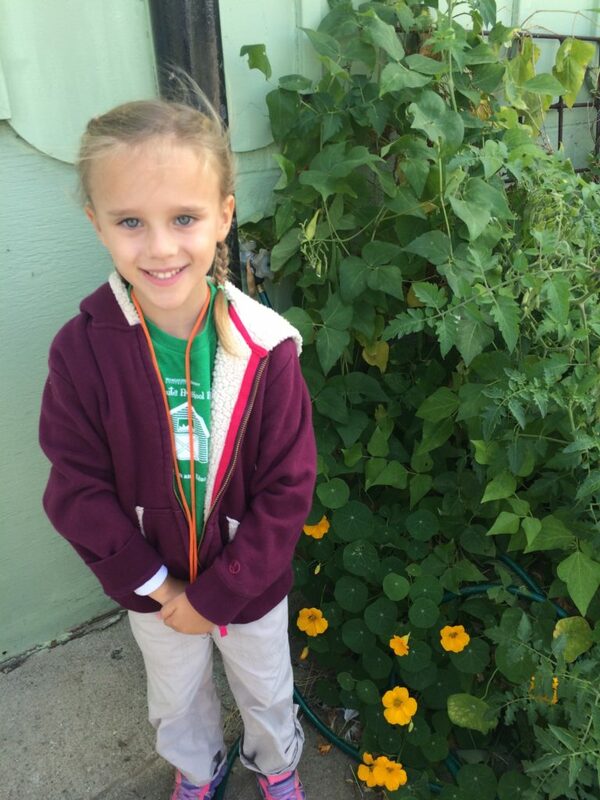 One of our returning Farm Sprouts was happy to note the nasturtium and beans we had planted were producing fruit and flowers! 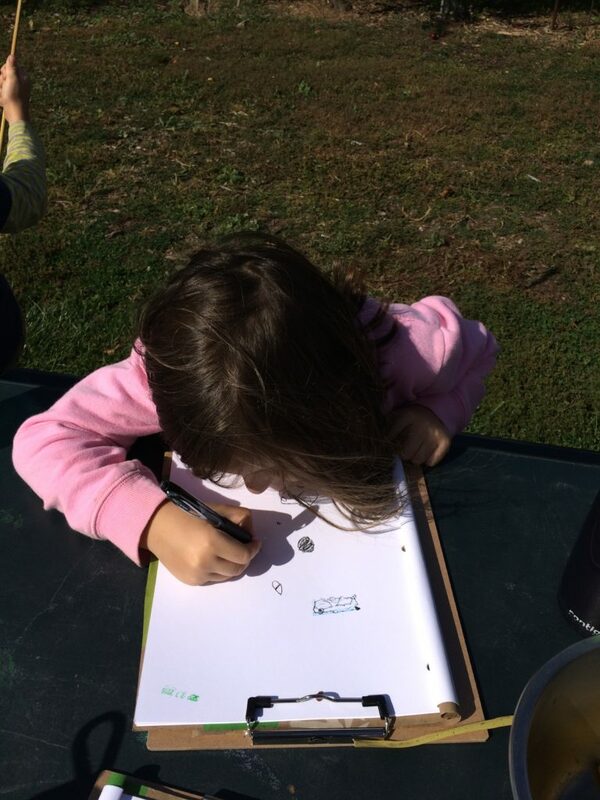 During snack, we also worked in our journals, documenting seeds from our nature discovery tray and other findings from the day. 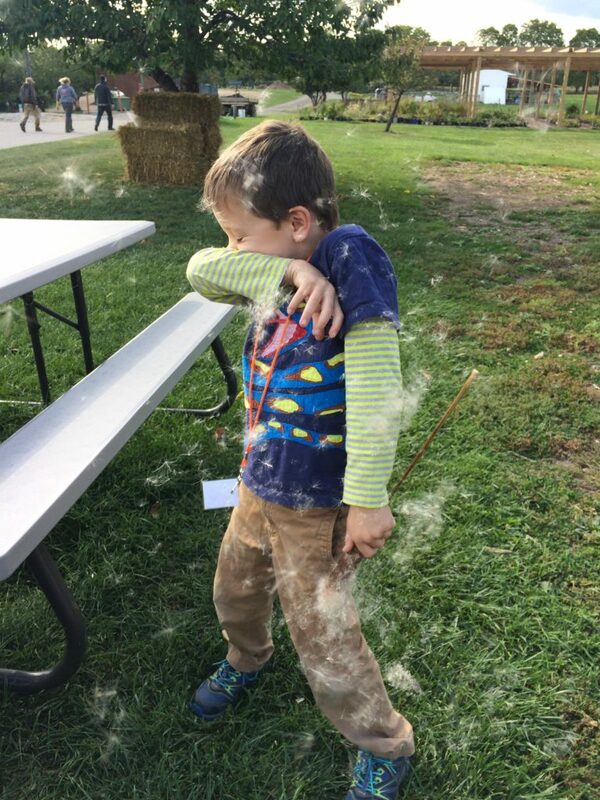 One child started pulling seeds from a cattail in the tray and before we knew it, we were all wrapped up in the magic and excitement of watching it disperse its seeds into the wind! 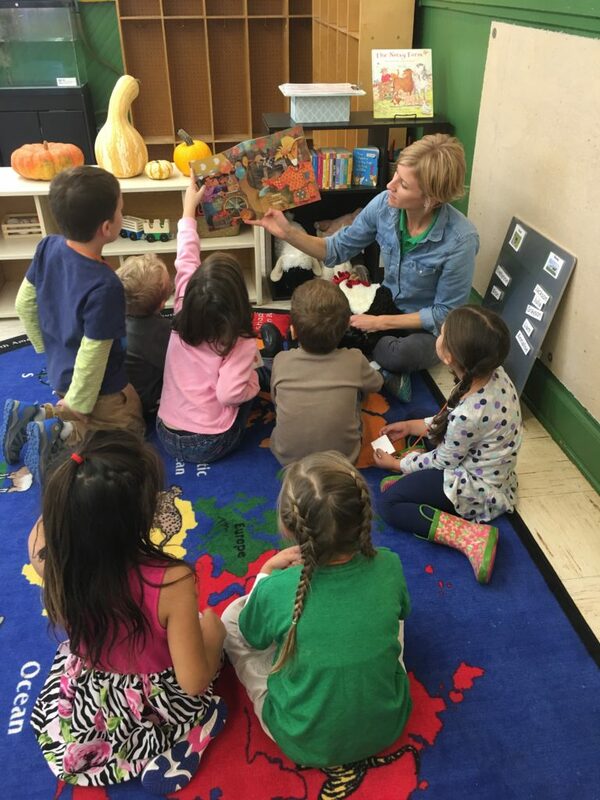 They had decided as a group to read The Tiny Seed by Eric Carle this week and the cattail experience along with the story was the perfect ending to the day.